Luca Landucci (1436?–1516) was a Florentine apothecary who kept an account of the daily occurrences in his city from 1450 until his death in 1516. These excerpts describe the activity surrounding the procession of the Impruneta into the city. 30 May 1483. Our Lady of Impruneta was brought into the city, for the sake of obtaining fine weather, as it had rained for more than a month. And it immediately became fine. 19 May 1494. Our Lady of Santa Maria Impruneta was brought in to the city, in hopes that the rain might cease: and our prayers were granted. 17 February 1499. 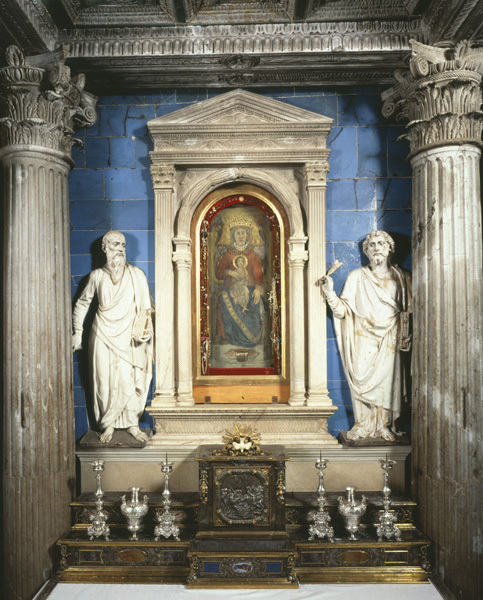 The tabernacle of Our Lady of Impruneta was sent for, to enable us to decide whether it would be to our advantage to join the League, and leave the King of France. 24 August 1499. The tabernacle of Our Lady of Santa Maria Impruneta was sent for to Florence, and many gifts were made. And the following incident happened as it was passing under an olive-tree on the way here: a little branch of the olive-tree caught on to the star of Our Lady’s mantle, and remained fastened to the star; and some of those who were carrying the tabernacle wished to knock the branch off with a stick, but although they tried several times, they could not detach it; hence it was considered to be a miracle (because at this very time a battle was going on with the Pisans, and there was a great question whether we should be victorious or not); and now those who observed this said: “It is a good sign that she should bring the olive branch to Florence.” And this fact was spread through the city. And when the tabernacle reached San Felice, they took the mantle off and detached the olive-branch, and fastened it on again in the same place where it had been before, that is: on the right shoulder, for everyone to see, coming and going. It was a little fork made by two small branches, about a span long. 27 December 1501. 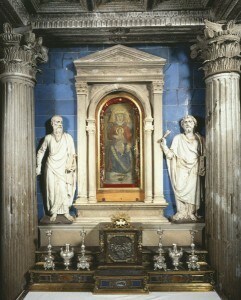 The tabernacle of Our Lady of Santa Maria Impruneta came to Florence, and a solemn procession was made and great veneration paid to it; this was said to be on account of the King of France having demanded unjust concessions, wishing exile to be recalled and the ruling magistrates to be nominated according to his pleasure. 6 May 1509. The tabernacle of Our Lady of Santa Maria Impruneta was sent for here, on account of there not having been any rain for some time: and the next day it rained, by God’s mercy, who is always gracious to us through the prayers of the Blessed Virgin. 22 May 1511. The tabernacle of Our Lady of Santa Maria Impruneta was fetched to Florence so that it should cease raining; for at this time there had been too much wet. Many gifts were made, exceeding any ever made before. There were eight very rich mantles, and many chasubles and cloaks, and silken draperies to the number of 24, and tapers of white wax and yellow wax, up to 90, and a beautiful cross. 26 September 1512. The image of Our Lady of Santa Maria Impruneta came here, to celebrate the grace that had been granted us of our city not having been sacked; for we had been in great danger, with 18 thousand persons within the city, and as many without it, everything being in uncertainty all the time. Luca Landucci, A Florentine Diary from 1450 to 1516, trans. Alice de Rosen Jervis (London: J. M. Dent, 1927). J. M. Dent is an imprint of The Orion Publishing Group, Ltd.